Acne is a skin condition characterized by clogged pores like blackheads and whiteheads, as well as lumps appearing deeper in the skin on the face, neck, chest, upper arms, shoulders, and back. Though commonly associated only with teenagers, acne is prevalent among adults as well and can even be seen in people into their 40’s. One of the major concerns about acne is that even less severe cases can leave scars and even cause disfigurement. The reality is that acne is so widespread that 60 million Americans suffer from it and 20 million of them have cases severe enough to cause scarring. Acne causes inflammation in the dermis that deforms the collagen in the skin. This can result in the formation of depressions or “pits”, commonly referred to as acne scars. There are a variety of classifications for acne scars including a boxcar, ice pick, and rolling scars. 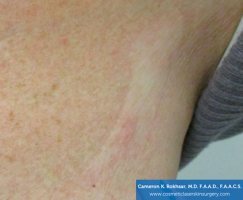 In efforts to improve the appearance of these scars, lasers are often employed to resurface the skin and even out its texture. New York Acne Scar doctors have traditionally turned to lasers like CO2 and erbium to treat them, but these often leave patients with significant downtime after the procedure. Other non-ablative lasers, including SmoothBeam and CoolTouch, avoid the issue of downtime by not removing any skin but they do so at the cost of effectiveness. The above facts may not sound like much cause for celebration, but we have great news for acne sufferers in New York and abroad! 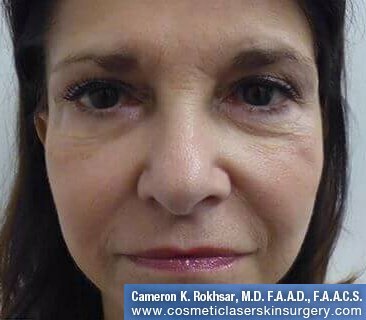 Dr. Rokhsar, having been instrumental in the development of the Fraxel laser even in its prototype stage, has discovered its effectiveness in the treatment of acne scars. He conducted the first study on the use of fractional resurfacing to treat these scars and found that Fraxel laser treatment can result in significant improvement for acne and surgical scars over other methods. Punch excision is a surgical procedure used for deep acne scars. This method of treatment for acne scars requires local anesthesia. A tool called a punch biopsy tool is used to cut out the scar. The normal edges of skin are then stitched together. This allows a more controlled healing process. The edges of skin being sewn together are undamaged by scarring; so they are able to heal in a normal manner. All skin lesions heal with scars. There will be a scar following this procedure, but it will eventually fade away. In addition, the area will have skin that is more likely to respond to other therapies, such as Fraxel resurfacing. The Fraxel laser enables New York acne scars patients to heal rapidly by only resurfacing a portion of the skin at a time, with treatments occurring every few weeks until completed. This gradual method eliminates skin sensitivity that often occurs when traditional laser resurfacing is employed. Fraxel laser treatment also stimulates collagen production at the treatment sites, allowing your body to naturally fill in pitted scars caused by acne. 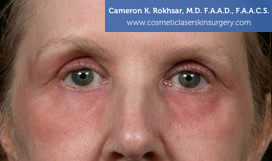 Dr. Rokhsar may recommend scar subcision for the treatment of acne scars. Since scar tissue depresses the skin’s surface, a scar subcision treatment is ideal for patients with deep, rolling or chicken pox scars. This procedure breaks up scar tissue and offers significant improvement, especially when combined with a Fraxel laser resurfacing treatment. During the simple, in office treatment, Dr. Rokhsar utilizes a sterile needle to stimulate collagen growth and breakthrough fibrotic strands, finally minimizing the appearance of the scar. This minor surgical procedure is used to offer cosmetic improvement for moderate to severe scars anywhere on the body. Depending on the severity of your scar and the amount of correction needed, you should notice remarkable improvement within 3 to 6 office visits. Acne scarring is the result of inflammation in the lower layer of the skin called the dermis which causes the collagen to become deformed or scarred resulting in depressions in the skin. Acne scars, which are quite common, are classified into a boxcar, ice pick, and rolling scars. 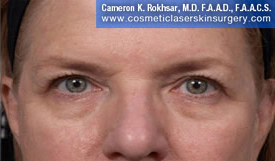 Lasers are a commonly used modality in the treatment of acne scars. 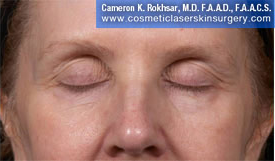 Laser resurfacing has long been used in the treatment of acne scars. A woman who developed stretch marks after breast implants. 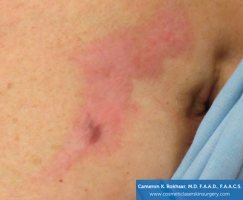 55 year old female with burn scars from boiling water after a few sessions of Fraxel laser. Fraxel Re:store is the most efficient treatment for scar reduction. 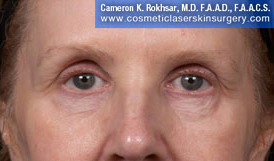 Dr. Rokhsar is a leading authority in Fraxel laser resurfacing for over 10 years. Traditional resurfacing lasers like CO2 or erbium can cause improvement in acne scars but require a long downtime. Non-ablative lasers such as SmoothBeam and CoolTouch do not remove skin but at best are minimally effective in the treatment of acne scars. Fractional resurfacing by Fraxel treat acne scars with shorter downtime. 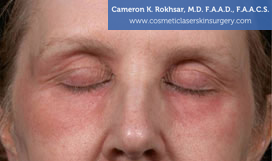 Dr. Rokhsar has been instrumental in the development of the Fraxel family of lasers, having worked on a prototype device and has discovered its effectiveness for acne scars. Dr. Rokhsar has published the first study on treatment of acne scars with fractional resurfacing and has developed the parameters for use of this laser in the treatment of acne scars on a prototype device. This laser resurfaces the skin gradually, which allows for rapid healing while eliminating the risk of rawness associated with traditional laser resurfacing procedures. The zones of thermal laser damage serve as a stimulus for collagen production, filling in the pitted appearance of acne scars with your own collagen. In a study conducted by Dr. Rokhsar, Fraxel laser resulted in meaningful improvements in the appearance of acne and surgical scars. 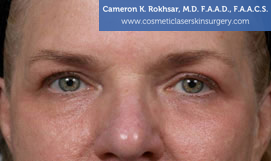 Dr. Rokhsar will tailor the procedure for to your skin depending on the type of acne scars that you may have. He may recommend subcision for rolling scars as well as combining the Fraxel resurfacing procedure with punch excisions for ice pick scars. Scars on any body surface area can be treated with the Fraxel laser, although scars on the face respond the best. You will begin to see results a few days post-treatment. Results are cumulative and it takes a few months to reach peak improvement. Your skin will gradually get better and better as the skin regenerates from the inside out. These lasers are considered safe and effective on all skin types, including African-American, Indian, Latino, Asian, and Mediterranean. 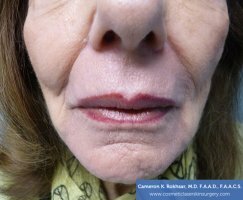 Dermal fillers are a solution to atrophic or deep pocket scars because of their ability to smooth out and fill in the holes of the skin or smooth out areas that have built scar tissue in a raised formation. 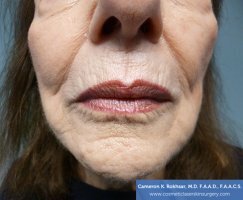 This specialized treatment works for segments at a time, and fillers such as Radiesse have been known to keep noticeable results last up to one year. Other fillers such as Restylane, Juvederm, Perlane, and Juvederm Ultra Plus have also proved effective. These fillers are made up on hyaluronic acid, a substance naturally produced in the body. Dermal fillers are intravenous substances that add volume to areas that are sunken in or loose, such as deep wrinkles or acne scars. The appearance of atrophic (sunken-in) acne scars can be immediately improved after a dermal filler is injected. Fillers only improve the texture of the scars; they will not affect any abnormal color within a scar. Injection of a filler takes just minutes and you can leave the office and immediately return to your normal daytime schedule. 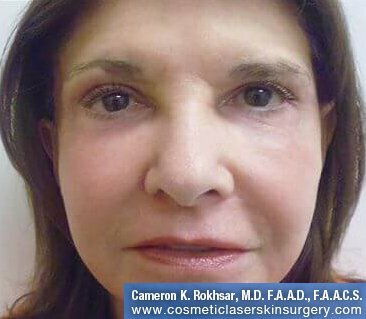 Dr. Cameron Rokhsar is an expert in treatment of acne scars with fillers and other modalities like lasers and laser resurfacing. 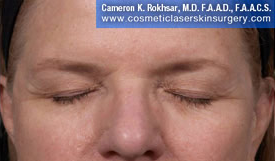 Dr. Rokhsar can help you choose the right fillers or laser treatments to diminish your acne scars. Dr. Rokhsar is internationally recognized as an authority on the use of Fraxel and other laser types in the treatment of acne scars. While there is no cure for acne scars, significant improvement in their appearance can be had under his care. Based on your specific needs, he will tailor a treatment plan designed to get you looking your best. Don’t live under the cloud of self-consciousness and embarrassment any longer. Call New York Acne Scars expert Dr. Cameron Rokhsar today for a consultation, and take the first step toward revealing a clearer more confident you.